A Feltzer in GTA San Andreas..
"It takes a certain type of special person to be able to handle a car like this. A trend-setter, an individual, a winner." The Feltzer is a sports car featured in Grand Theft Auto: San Andreas, Grand Theft Auto IV and Grand Theft Auto V. In each game it is a two-door car with a high top speed, each based on different models of Mercedes-Benz two-door coupes. The car is manufactured by Benefactor in the HD Universe. 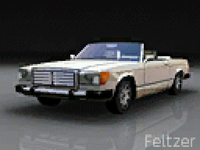 In GTA San Andreas, the Feltzer is a convertible, and is based on the real-life Mercedes-Benz R107 that was produced from 1971 to 1989, specifically the 380SL cabriolet. The Feltzer has a good top speed but rather slow acceleration, and its handling is unsatisfactory as its high speed and light weight act against it. It sounds as if powered by a V6, due to sharing its in-game engine sound with the Blista Compact, Majestic, and Club. The Feltzer in GTA San Andreas can be modified at a TransFender, but features very limited modification options. In GTA IV, the Benefactor Feltzer is a luxury-sports convertible and is based on a fifth generation Mercedes-Benz SL. There are several variations of the Feltzer convertible in GTA IV; Feltzers may be seen with a folding hardtop, like the real life SL, with a softtop convertible, or with the roof stored beneath a tonneau cover. Some are equipped with a badgeless black mesh grille, while others feature a standard three-bar grille with Benefactor badging. The rims are similar to those used by Brabus, a third-party Mercedes-Benz tuner. A Feltzer is glimpsed, largely unaltered in design, in the first trailer for GTA V. However, the final version features a drastically changed, wider body kit which may be depicted by the real-life Mercedes-Benz SL 65 AMG Black Series, while also sharing similarities with the Mercedes-Benz CLK DTM AMG. A Feltzer hardtop coupe in GTA IV (Rear quarter view, softtop; engine). Billboard advertisement of the Feltzer in GTA IV. A Feltzer in a GTA V trailer. A Feltzer in GTA V (Rear quarter view). The GTA IV rendition of the Feltzer is powered by a supercharged 3.8L V8, coupled to a high-performance 5 speed gearbox in RWD configuration, and the eighth-fastest car in the game, and the slowest of the sports cars. Acceleration is decent (with a tendency to cause wheel spin), and it has an enjoyable top speed of 290 km/h (180 mph). The Feltzer has also been noted for being one of the best drifting cars in the game due to its low level of Traction Control. The suspension is firm and responsive, keeping the Feltzer flat in the corners, albeit with some oversteer at high speeds. These qualities provide an accurate respresentation of the unforgivable nature the Mercedes' coupes provide. Braking is good, and ABS is an available option, though not standard. The Feltzer withstands high-speed frontal crashes well, thanks to its luxury build, and can sustain numerous frontal hits without failing or catching alight. The Feltzer is, however, highly susceptible to bullet damage. The Feltzer in GTA V performs better than its GTA IV counterpart, sporting a more powerful engine towards the rear wheel drive system. It has a large 6.0L flat-plane crankshaft V8 engine producing 666bhp (490 KW) making it one of the most high powered sports cars in the game. The car ditches the oversteer habit from GTA IV as it is meant for racing, acheiving one of the best lap times slotting down below the Jester and Elegy RH8. The Feltzer's top speed of 199 mph (321 km/h) is average for a sports car due to its high bulk of weight, barring it from reaching the speeds of the Carbonizzare, Surano, 9F, and Comet. Braking is below average as it will take approximately 1 city block for it to stop. It makes it purposeful for a getaway vehicle due to race-inspired handling and hard suspension. Gracie Ancelotti's pink convertible Feltzer (with Gracie at the passenger side), without the stock frontal grille. A unique pink convertible Feltzer owned by Gracie Ancelotti appears during "...I'll Take Her", when the car is used by the player to kidnap Gracie for ransom. Upon completion of the mission, the car is driven away to be disposed of. The player can gain possession of this Feltzer to keep by immediately killing the driver after hiding Gracie in the safehouse, but the player must be quick as it will disappear after about 30 seconds; an ideal method is to snipe the driver promptly as he leaves with the car. Alternatively, it can be acquired by firing a gun across the street from Gracie's house before meeting her, she will run off, but the Feltzer will stay in the driveway. Do NOT respray this Feltzer, as you will never be able to achieve this paint color again. After collecting all thirty cars for Stevie; he agrees to purchase cars from Niko Bellic, with the Feltzer fetching $3,000. A picture of a work-in-progress Feltzer in GTA San Andreas found inside the Driving School. The name of the Feltzer may be a play on the sexual act of "felching". An early iteration of the Feltzer in GTA San Andreas, with headlights and front turn signal lights more alike those seen on Mercedes-Benz R107s, is depicted on a hung picture inside the Driving School. In GTA IV, if the player takes a Feltzer with its roof down to a car wash, the vehicle will be washed by hand. In GTA IV, players will note that the hardtop Feltzer doesn't have side windows, so you will hijack it by just opening the door, similar to the 'beater' Vigero, and the Peyote. In Mafiya Work, in one of the tasks Petrovic tells the players to get a pink Feltzer for his daughter. Radio Los Santos in GTA San Andreas. Jazz Nation Radio 108.5 or Fusion FM in Grand Theft Auto IV. Usually found in west Los Santos, much of San Fierro and occasionally in Las Venturas. Importable from Easter Basin, San Fierro after completing export lists for $28,000. Spawns in the traffic around Hove Beach, Cerveza Heights, The Exchange, Star Junction, The Triangle and Middle Park. Ocassionally spawns at Auto Eroticar parking lots. In GTA San Andreas, a bulletproof, damageproof, explosion-proof and fireproof Feltzer can be found (and is used) in the final storyline mission, "End of the Line", during which the player and Sweet must chase Officer Tenpenny in the car. Patrick McReary is seen driving a bright red Feltzer in his GTA IV character trailer. Gracie Ancelotti is mentioned in GTA IV to be in the process of selling her bright pink Feltzer. During "I'll Take Her", the car is used as a kidnap vehicle and would later be disposed off by Stevie after Gracie is dropped off at a hideout. This page was last modified on 5 February 2015, at 02:23.